In this economy, companies are constantly being challenged to grow, and when they refuse to grow, they simply shut down. Some companies have found the success formula and, consequently, they have found that their profits are at a good level. Other companies have been forced to shut down. Many of them have repeatedly made one common mistake – they mismanaged their inventories or even left them unmanaged. As a consequence, it turned out that keeping track of a growing inventory can be a very tedious task without the appropriate tools. Some companies used Excel as the last resort. It is a program that is often thought to be one of the very best solutions to managing inventory. Excel might be a common solution, but it is hardly the best tool for rental inventory management. Why isn't Excel the best solution for rental inventory management? Excel is one of the most frequently used tools for rental inventory management, but this doesn't mean it is the best option for company owners. Even though its benefits, such as user-friendly interface, might make it appear very rewarding, Excel should be avoided in performing inventory management. Excel workbooks are not real-time and the data represented doesn't work well in the real time with the customers. Due to its design, you are only able to use a single Excel workbook at a time, which makes inventory management very slow and tedious, especially when one wants to edit the inventory logs. Windows and Excel itself may corrupt your workbooks and the logs can be corrupted due to the limited security and maintenance that is presented in Excel. Is there a better program for rental inventory management? Considering that Excel may fail your company as an inventory manager, you should seek other choices that will prove to be a better solution to inventory management. 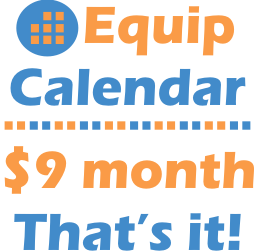 EquipCalendar is an excellent program for inventory management, as it provides an easy-to-read and an easy-to- work system that runs smoothly. EquipCalendar will help you navigate through the complexities and difficulties of rental inventory management, as it is very easy to work with. Knowing how to manage your inventory is a critical skill to have, but it isn't a skill that is difficult to pick up on. Pick EquipCalendar today, as it is sure to be the easiest to use software in the rental management industry. Based on customer feedback, we recently added the "Weekly" view, which is a new addition to our other views, Monthly and Daily. The Weekly view is pretty cool, especially for those wanting a print out of the next week (i.e. 7 days) of work ahead. Consider it a weekly agenda or a getting things done (GTD) manifesto! The Weekly View can also switch between viewing your rental events (i.e. tasks) and rental inventory for the given week.